Been waiting for a while for this, I played ingress for a while but i'm a massive pokemon fan so this is as close to having pokemon as i can get. Although i'm not too ecstatic that you cant battle other people, this is at least a start. At work i have picked up a bulbasaur and a caterpie right in the shop. I think its going to be very interesting to see how it goes. Anyone else going to have a go? Funny timing. I told a work colleague that it was due out this morning, then a couple of hours later another colleague told me it's out. - On iPhone 5, SETTINGS and TIPS almost never respond to touch. It just reverts back to gameplay screen. - All 3 Starter Pokemon don't seem to always be visible. I saw only Bulbasaur, and Charmander only briefly appeared AFTER I caught Bulbasaur. Didn't even see Squirtle. Typical of day 1 things, it had already experienced its first service overload outage briefly a couple of hours ago. Time to start walking more lol... haven't had much of a chance to catch anything that great.. but have a lot of my friends playing. so should be pretty interesting. Interesting that it's compatible with tablets. I was able to get it running on my Galaxy note tab 2014 model. note2's not exactly a tab, more a phone/phablet category. but yeah, I was surprised when it didnt appear on the play store, but know the note2's gpu is good enough, i was pleasantly surprised that a direct apk installed and worked. I'm finding it's not short-listing properly just yet in Play store. I was told by my work colleague to add "niantic" to the search string. 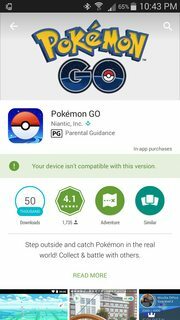 Using the apk i could get to the playstore page, its just hidden if i try to search pokemon go. Servers don't seem to really handle load. Was working for a bit this morning, then the point of interest type things which give you items stopped working. Restarted game and servers once again not available. Le sigh..
had an issue with the "servers are busy" this morning but managed to catch a clefairy while waiting for the shower and an eevee while on the shitter last night haha. 12 pokemon so far 4 being doubles. Strangely the wife is mad keen on it too. Might have to go for a drive up into town to do an ingress walk to stock up on pokeballs. How are you finding and catching pokemon while sitting on the shitter? Do you not need to be walking around? no i was seriously on the shitter with the app open and bam "a wild eevee has appeared". The clefairy i caught while in bed this morning waiting for the missus to finish washing her hair. I was stationary in the workshop this morning and caught yet another pidgee. I don't think you "have" to be walking around but it does help. they seem to have partially randomised spawn points/wandering patterns. have one of these close to my home, caught 3-4 pokemons from the same general street corner in the span of 4-5 hours last night. am finding that some of those leaf flutters don't have pokemons either because it's designed like that or there's an issue somewhere Forcing me to walk for nothing! Performs like a pre-alpha turd on iOS. I've spend more time at a post-crash app menu than in the game itself.